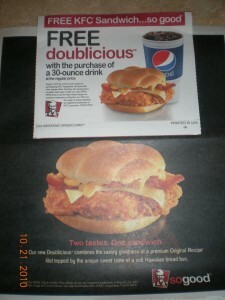 KFC: Free doublicious with the purchase of a 30-oz drink! Check the USA Weekend or Parade section in your Newspaper for a KFC coupon! Coupon is good for a Free doublicious with the purchase of a 30-oz drink! Previous post: Southern Plate Cookbook Giveaway!